Keep your wooden fence looking nice and clean! A wooden fence can be a great addition to any home. Not only are they aesthetically pleasing, but they are easy on the wallet. However, in order to keep them looking beautiful, they need to be cleaned on a consistent basis. Without regular cleaning, wooden fences can grow algae, mildew, and mold eventually leading to rot. You don’t need to rent a power washer for regular maintenance. There are several other methods to get that wooden fence looking good as new in no time! The first thing you want to do to clean your fence is to set the stage. Cover any nearby bushes, flowers or other plants to protect them from the bleach you’ll be using. Get your cleaning solution prepared by mixing one part bleach with two parts warm water. For every gallon of water you add to your bucket, consider adding a teaspoon of mild soap to create a more gentle mixture. The most difficult part about not using a power washer is the fact that it requires a bit more energy. However, with the right amount of effort, it shouldn’t be a problem to get your fence looking good as new. Use a scrub brush and focus on stained areas and once they’ve been removed, rinse off the solution. This more focused approach can have the benefit of making sure your fence is thoroughly cleaned and stain-free. 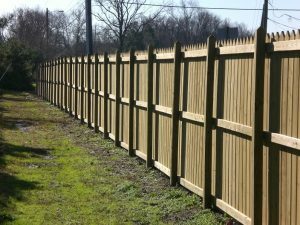 When your wood fence is dry, fix anything that looks damaged. For example, deal with any nails or screws sticking out, and sand down any rough area of the fence. You may consider a new coat of waterproof paint to help improve your fence in the long term as well. This entry was posted on Friday, June 23rd, 2017 at 12:01 pm. Both comments and pings are currently closed.